Check out our discussion on this topic between Heather (@borealblooms) and I on our podcast webpage sustainableflowerspodcast.libsyn.com, or read on! My first “in person” experience with dahlias was at the University of Alberta Devon Botanic Gardens, approximately 6 or so years ago (my memory is not so good having crested the half century!). Shortly after the entrance to the gardens there was a display bed overflowing with these four foot high dazzlers in the most astonishing colours and forms I had ever seen. None of the photos I had seen in books or magazines compared to these! I started my growing adventures with about 10 varieties ordered from Ferncliff Gardens in B.C. the very next year. They were beauties, but I had not mastered the soil and fertility management necessary to grow them as well as they were grown and displayed in Devon. After that first year of less than perfect blooms, I joined the Alberta Dahlia and Gladiolus Society (ADGS), hoping that I would find fellow dahlia aficionados with whom I could delve into all the details of dahlia cultivation, and indeed I did. It is through the generously shared, accumulated wisdom of these devoted and enthusiastic growers that I learned how to properly store my tubers, how to fertilize, prune and show these divas. It was here, also, that I learned about the dahlia virus(es). Initially I did not pay too much attention, as I had not seen any indication of disease in my plants. In my second year of growing dahlias I grew about 50 varieties, with my improved knowledge of their care my blooms were so much better, and with the encouragement of my friends at the ADGS I entered my first show! Such fun! However, it was also that year, with my more trained eye, that I noticed a few of my plants seemed to have stunted growth and oddly shaped leaves and/or unusual blotching on the leaves. I went back to my notes and read up more on the dahlia virus that we had discussed at some of the ADGS meetings. It was evident that those dahlia plants had a virus of some sort. As soon as I understood this, I threw them out, not wanting to have anything spread to my other beloved plants, as I had learned “If in doubt, throw it out” at the ADGS. The ADGS is a member of the American Dahlia Society (ADS), and as a result we get to hear first-hand about the fascinating dahlia research that is stewarded by the ADS, one of the programs being focused specifically on dahlia virus. 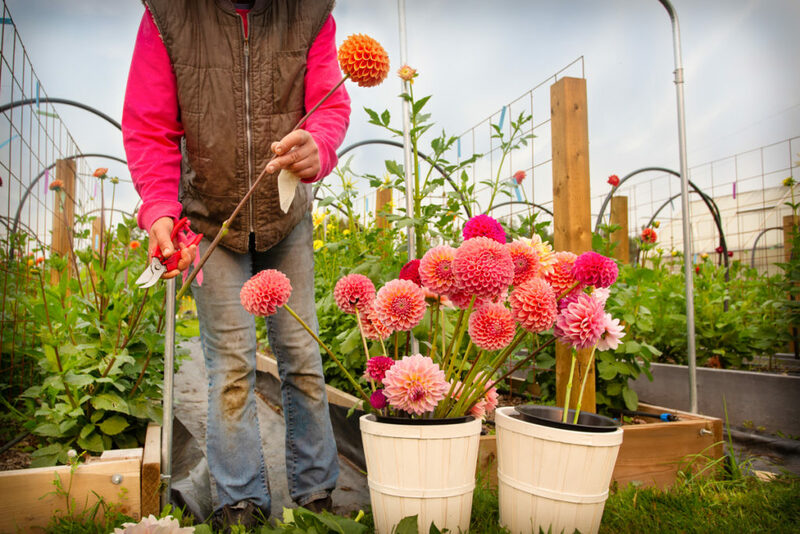 The research underway at Washington State University under the direction of Dr. Hanu Pappu, the Carl F. and James J. Chuey Endowed Chair for Dahlia Research and Development is aimed at “the identification, control, and elimination of virus diseases in dahlias”. Dr. Pappu is very familiar with our Canadian prairie conditions, as he completed his PhD here at the University of Alberta! Like us, animals, and other plants ,dahlias can become infected with viruses. The viruses that affect plants are different than those that affect us, but in both cases the viruses weaken and can sometimes kill their “host”. At their simplest, viruses are little pieces of nucleic acid (genetic material) wrapped in a thin coat of protein. (I don’t know why, but I always envision sub microscopic uncooked spring rolls when I think of viruses 😊). Viruses are obligate parasites, which means they can only survive in the living cells of their host. “Viruses enter and take control of the cells of the host (that is, the dahlias, in this case or in you or me in the case of human viruses) and are able to direct these cells to make more viruses, until just within a few days millions of virus particles are produced per infected cell. As the host cells divide, they carry the virus inside them”. (http://www.nzdahliasociety.50megs.com/viruses.html). In addition to this very fast and effective mechanism for growing and spreading within their hosts, viruses have evolved unique and efficient ways of working with vectors (insects and us! ), seed, pollen and tubers to move between hosts (plants in this case). Now you know why we say that something on the internet has “gone viral” when it spreads around the world and is seen by millions in very short periods of time! Viruses are small but mighty! So back to dahlias and viruses. The dahlia “virus” is not actually a single virus, dahlias can be hit by one or a consortium of several viruses that also affect other plants. 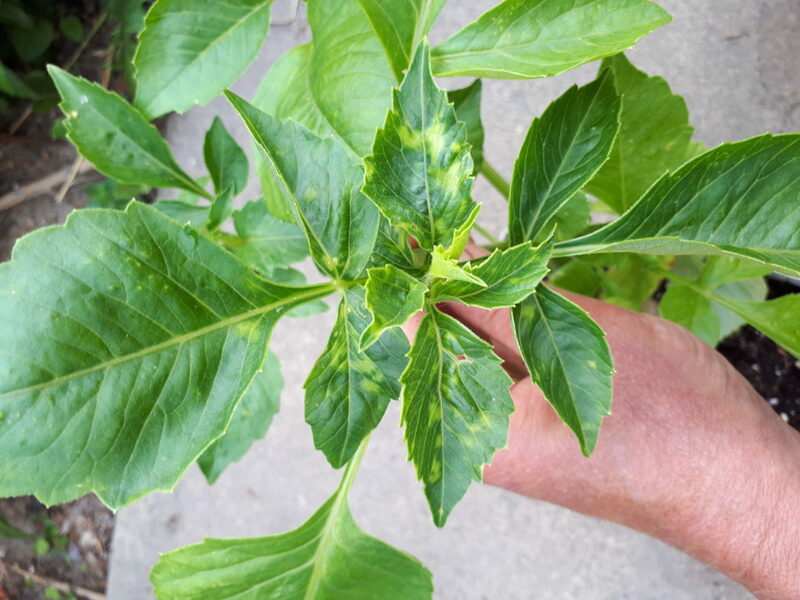 The common viruses of dahlias are Cucumber Mosaic Virus, Impatiens Necrotic Spot Virus, Tomato spotted Wilt virus, Tobacco Streak Virus, Dahlia Mosaic Virus and Dahlia Common Mosaic Virus. There are many other viruses that affect dahlias but these are the most common in home gardens. What does an infected plant look like? The ADS has some of the best photos of infected plants, to help you identify if your plants are affected. Check out their archive of photos at https://dahlia.org/wp-content/uploads/2018/01/ADS-DMV_Symptoms_Slides.pdf. There are also photos on the WSU website at https://dahlia.wsu.edu/virus-symptoms/. The photos below are of my plants last summer. 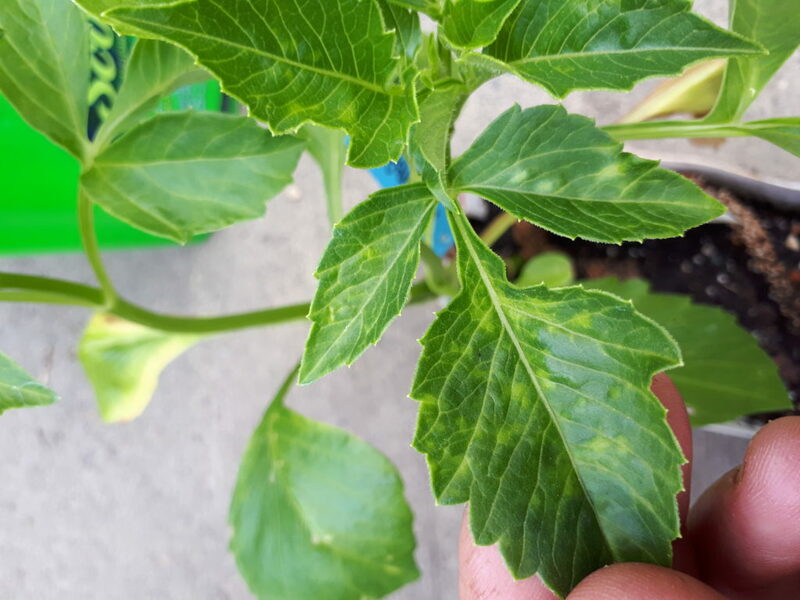 While I did not have the plants tested (we don’t have access to the testing here in Canada yet), the symptoms are consistent with dahlia virus. I discarded these plants and their tubers. Chlorotic yellow spots, yellow blotching (mosaic). Photos mine. In addition to growing dahlias for pleasure and the challenge of showing them, I also sell my dahlias at a local market. One virused plant represents a serious threat to my entire collection, so I am as vigilant as a hungry hawk, and although it pains me, I am brutal about following the “if in doubt throw it out” principle. Last year alone, I discarded 25 % of my plants (I was growing approximately 300), most of them newly bought varieties, because of evidence of virus. This represented the equivalent of almost one thousand dollars of expense in the form of the cost of the tubers (and shipping!) and the cost of lighting, heating, fertilizing, space and labour to bring them along and plant them. I also lost the income that would have come from the sale of the flowers, but I couldn’t risk my good plants and tubers. In your home gardens, keeping infected dahlias may or may not reduce the number of flowers they produce, depending on the varieties you are growing, but insects could transmit the viruses to your vegetable crops or other ornamentals that you value. It is unfortunate that it often takes until the plant is growing in your garden before you see the evidence of infection, but as soon as you do, the best control is to just yank the whole plant, tuber and all and throw it in the garbage. If you clean your tools with soap and water or with a 10% bleach solution between uses on plants you will go a long ways toward preventing the spread of dahlia virus! Anytime you cut or even handle a plant such that the hairs on the leaves are damaged, you have created a possible entry point for virus from your hands or the tool you are using. Always wash your hands after handling infected plants, and even between plants that may appear healthy, as you are a potential vector in this situation. Follow the cleaning instructions provided by the experts in this easy-to understand downloadable document provided by Dr. Pappu on the ADS website: https://dahlia.org/wp-content/uploads/2018/10/VirusFall2018.pdf. Some cultivars of dahlias appear to be more resistant to viruses than others and Dr. Pappu and his team are investigating which ones and why. 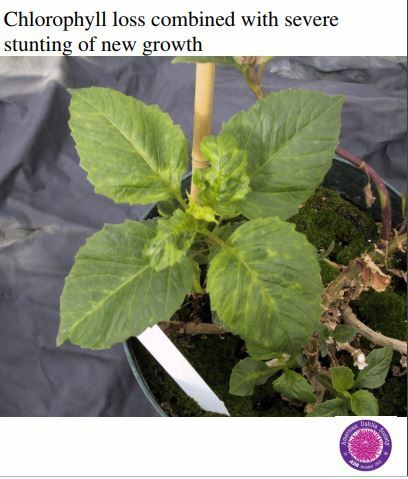 Research is also underway to propagate virus free dahlia stock through meristem culture, so in the future suppliers of tubers can fully guarantee virus-free stock. Keep your eye on the ADS webpage and the WSU webpage for all the news on how the research is progressing and what it means for you!